There are countless of Canon camera users around the world, a significant part of whom are beginners. It is necessary for beginners to learn some basic tricks to get the hang of Canon cameras, instead of giving up the expensive shooting device after several tries to open RAW photos on computer. In this article, we are going to introduce 10 useful settings you should know to use Canon camera as a beginner. While using Canon Camera you will face the difficulty in changing the shooting mode. There are varieties of creative modes that you can use while capturing the image. Your task is to move the Canon cameras among these modes by using the circular dial present on the top of the camera. It is rotated among three levels: Entry level, Mid-level, and professional level. The entry level has more variations than the other two levels. Entry Mode: There is one dial for it, behind the shutter button. You can change the setting to the other modes by holding the Exposure Compensation button that is present on the backside of the camera. Program mode & Aperture Priority mode: you can easily change the aperture but it also gives you the easiness of automatic changing. Exposure Compensation is responsible for changing the exposure. Shutter priority mode & Manual mode: you can easily change the shutter speed but it also gives you the easiness of automatic changing. Exposure Compensation is responsible for changing the exposure. The third main part of the exposure phase is ISO. ISO button is present on the top of your camera. So, for its setting press it and use the shutter speed dial or D-pad. Now again, either click the ISO button to do halfway shutter down or press the Set button to choose the options on D-pad. You can choose the desired shutter with this method. There are 3 different autofocus modes in canon: One Shot, AI Focus, and AI Servo. All modes serve the same purpose with slight changes. Depending upon the demand of photoshoot you can select any. For mode selection, press the AF button present on the back side of your camera and then use D-pad to select the desired mode. Canon camera is enriched with autofocus points on the sensor. In default mode, the image is automatically focused through this sensor. But you can also set it manually. For Auto-sensor selection, press the AF button present on the back side of your camera and then use D-pad to select the desired mode. You need the self-time setting for capturing your own picture. If you are a photographer than it will be unfair that you don’t get a chance to capture your own image. Canon has 2 to the 10-second timer. To fix the timer select the timer or shooting mode button that is present on the back side of your camera. You will see the options, select the icon with a 2-second timer or more. After the above setting, you can set the camera to the burst mode again. It means changing the shooting type to single to continuous. You can use your camera to shoot videos or movies. From the previous few years, the power of the DSLR becomes double. You can convert its mode from capturing to video by clicking the main button several times. To record video, press the record button. You can capture the pic while remaining in video mode. There is a file called RAW file that is more powerful and produce high quality of image other than DSLR. You have to decide the format of image jpeg or Raw. To swap these formats press the menu button present of the back side of your camera and select the Raw option. This is the most important activity and repeated step during the whole photoshoot. To check the photos either they are focused or not you have to review the images. For images’ review press the play button and then go through the images using D-pad. Don’t delete the image directly from the SD-card as it can lead the data corruption or destroy your card. When your card is full, then you can transfer the data to PC and then format your SD-card. Press the menu button and then move to end using D-pad. Select the Format card option and hit OK to clear your card. Note: Make sure to back up your images before formatting your SD card. In case you lose precious data due to mistaken deletion or formatting, don’t hesitate to use RePicvid free photo recovery software to recover deleted photos from SD card for free. 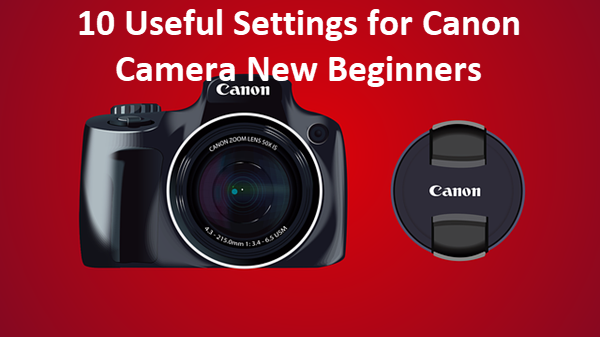 In this article, we have listed the 10 useful settings for Canon camera beginner users. Have a try with them and start your mastering of Canon DSLR now. If you have any questions or valuable experience, feel free to share with us by dropping a line in the comment.